I like a good hamburger as much as the next guy…but the truth is, most often they aren’t the ones made on my grill! 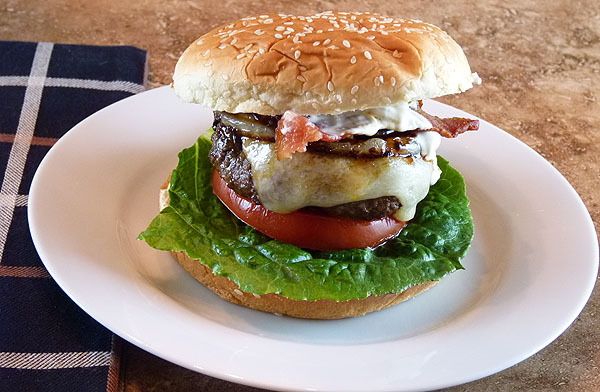 I’ve used a quick grilled hamburger most often when I was cooking when my kids where still at home for those dinners when there is no time for anything else; kids have to be delivered to multiple locations, too much homework or any myriad reason but it’s ground beef, onion, ketchup, salt and pepper and on the grill. Chips on the side! So this foray into more of a specialty burger with jalapeno and bacon AND grilled onions was taken on with some trepidation. I knew it would take longer. I wondered if guests would think I made the effort they had come to expect when invited for dinner. I had a couple of reservations but decided to move forward. It was for Labor Day Weekend and a burger seemed to fit the bill. That was in the summer of 2005; not long after the recipe originally appeared in the July issue of Bon Appetit magazine. It did require some prep time but I heard the coffee glaze calling my name and the dressing had everything I love; a combination of sour cream and chiles resulting in a great creamy and spicy sauce. I found the coffee glaze to be subtle but absolutely necessary to the amazing end result! Let me tell you…this did not disappoint. If you are looking for a low fat everyday burger…walk away. But if you believe everything in moderation like I do (I’ll eat Cheerios for breakfast and lunch if I know I’ll be having something like this for dinner!) this is a burger you should reward yourself with one day; maybe today!? Serve this burger with some simple sides and my favorite margarita and I’m betting you get raves too! Seriously these Jalapeño Cheeseburgers with Bacon and Grilled Onions are one of the best burgers I’ve ever had; thanks Bon Appetit! The recipe does make a lot of dressing and glaze; I’ve not reduced those proportions because I found a use for them on other dishes…but from the comments at the Bon Appetit website, it sounds like they could be halved. Gently mix all ingredients in large bowl. Form mixture into eight 1/2- to 3/4-inch-thick patties. Place on small baking sheet. Cover and chill at least 2 hours and up to 1 day. Stir first 5 ingredients in small saucepan over medium heat until coffee is dissolved. Season glaze to taste with salt and pepper. Cook bacon in large skillet over medium-high heat until crisp and brown. Transfer bacon to paper towels to drain. Spray grill rack with nonstick spray. Toast buns until golden, about 2 minutes per side. Transfer buns, cut side up, to plates. Place lettuce on each bun bottom. Grill burgers 5 minutes, basting with glaze. Turn burgers, baste with glaze, and grill until cooked to desired doneness, about 5 minutes longer for medium. Press cheese atop each burger and allow cheese to melt. Place some sauce, then 1 burger on each bun bottom. Top each with 2 slices bacon and desired additional toppings. A coffee glaze? It’s the *little bit unusual* that gets me everytime. This sounds killer! Nooo… not heart attack killer, well maybe heart attack killer, but I mean taste bud killer! The Hubby would love this one! Miss Vino Luci, I was at your house last night when you made these incredible hamburgers, they were so delicious! Such a great combo with the rice you made. Your daughter even prepared a strawberry shortcake dessert from scratch and it was a nice way to compliment the meal. I am excited to make this meal on my own someday! Amazing! If your guests aren’t jumping and clapping with excitement at the sight of these then the hell with them, send them home! Incredible! The flavors blow my mind! Funny but expected guests had to cancel cause kid got sick. So daughter and a bunch of her friends coming over tomorrow night for a BBQ tasting. Have to admit, not that hard to get a bunch of 20 somethings to revise their plans at the thought of a home cooked meal! Cheeseburger with kick. Love it. I’m with you guys, burgers and non fat should never be expected or uttered in the same breath. I love a burger with a little kick. Sounds like a perfect burger to serve guests. What a mouthful of awesomeness. Fabulous burger, bookmarked! (and funny you mention the photo – when I saw the top of this post, I was like “wow, this is a departure from Barb’s usual style!” – now I can’t wait to see yours! Beautiful!!! I am never looking for a lowfat burger. I’m like you, I’ll save up calories just to have a cheese/sauce laden burger. And, boy have they made a production out of this! Looks worth all the fuss and I do plan to give this a try. Plans had to be changed cause friends kid got ill but now have a BBQ planned for tomorrow night. Come on over!